Oatley was named after a convict clockmaker – check out the commemorative clock tower in the village. The kookaburras started chuckling as soon as we entered Oatley Pleasure Grounds and were in full cackling mode by the time we reached the edge of the water at Oatley Bay Baths. As we looked at the uninviting murky water and the cold breeze blew in from the river, we wondered if they were laughing at us for even thinking of having a dip in a pool where nobody seems to swim, except for the odd duck or heron down near the shark net. We actually sat on the stone steps for quite a while, letting a curious fish get closer and closer, almost nibbling on my big toes before darting away again to the safety of the muddy water. And that’s part of the problem with Oatley Bay Baths: the water does seem to get pretty murky and muddy here. I must have got the tides wrong, too, as I was aiming for high tide but could see a damp line of sand about a metre higher than the spot where the little waves lapped up when we arrived. I eventually stepped down into the murk, actually having no idea if my step would take me out of my depth or be ankle deep since the water was so cloudy. In the event, it was about knee or thigh height so just about deep enough to take a backwards plunge and do a few cursory strokes towards the shark net before turning back and calling it a day. Fortunately I have no minimum distance criteria for this quest to swim in all of NSW ocean pools and harbour baths. Just getting in the water will do and a couple of strokes can be enough in my book. But Oatley Bay Baths probably goes under the category of pools where this felt more like a chore than a pleasure. So come on, swimmers of Oatley, tell me otherwise and give me a hint on the best time to come back for a decent swim here? 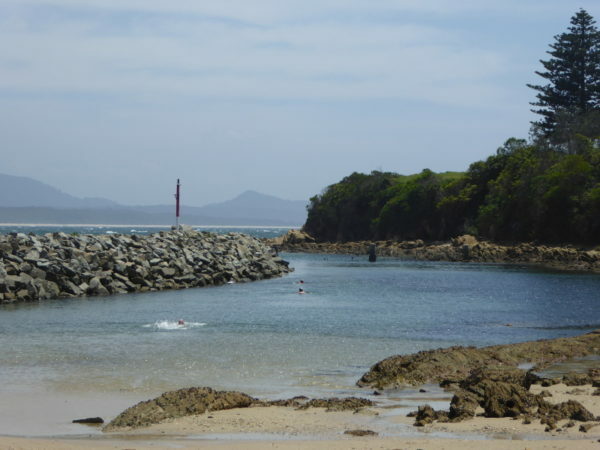 The baths at Oatley Bay are probably about 15 minutes walk back to Oatley station. There is free parking on the road above the Oatley Pleasure Grounds and you walk through the bush to reach the water’s edge. Two sets of stone steps lead into the water. You can also enter via the sandy beach but that meant paddling through a layer of brown foam, which also didn’t appeal too much. No showers at Oatley Bay Baths but there are toilets so there is a private space to change after your dip. Toilets are back up above the grassy area near the baths. Don’t try the building by the baths, though: that seems to be the HQ for the local Oatley Scouts meetings! Best come to Oatley Bay as near to high tide as you, but even then the water can be pretty murky here. I struggled to find any stories or links to any other piece on Oatley Bay Baths. I think the keywords overlap too much with my last pool review: for the baths on the other side of Oatley, at Oatley Park. If anybody has any stories, get in touch via the comments below. Nobody down here so no chance to swap stories with old-time swimmers. Just a mum and toddler playing on the little area of kids’ play equipment down here. I found no other links to articles on Oatley Bay Baths. There is nowhere near Oatley Pleasure Gardens for a post swim coffee, so it’s back to the main village not far from Oatley train station. But the coffee shop we liked there closed down, so where else do locals go for a post swim coffee?